Being a student is a lot easier than it used to be. If class gets a little boring, you can just check your email, text someone, or surf the Internet. It's also easier to not get bored because you can check out sites and information the teacher discusses. At least, that's how it was for me this week when I was a student at the Etech (Ohio Educational Technology) Conference. 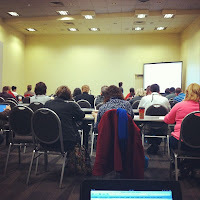 In every session I attended, participants were on their laptop, IPad, or smart phone. I did see one or two note takers with their legal pad, but they stuck out. A lot of sessions were interactive and presenters made it a point to share links and involve attendees. Sessions were obviously planned by the presenters to encourage the use of technology. Admittedly, as a student, I haven't always been attentive and have been challenged with being a little too hyper to sit in class for very long. One of my goals when I started teaching was to shut up, keep students busy, and let them learn through their own hard work. I have always hated classes where the teacher stands in front of the class and talks and talks and talks and talks. I couldn't help but think about how different adults are treated than kids. Maybe it's about having a captive audience with our students. Imagine how involved they would be if everything they did was interactive. Imagine how different teachers would be if their students could start texting or surfing the net when they got bored. It might not be totally a good thing, but it would sure liven up some classes. The best part of an opportunity like the Etech Conference is the chance to hear about what other teachers are doing and what is working in their classes. 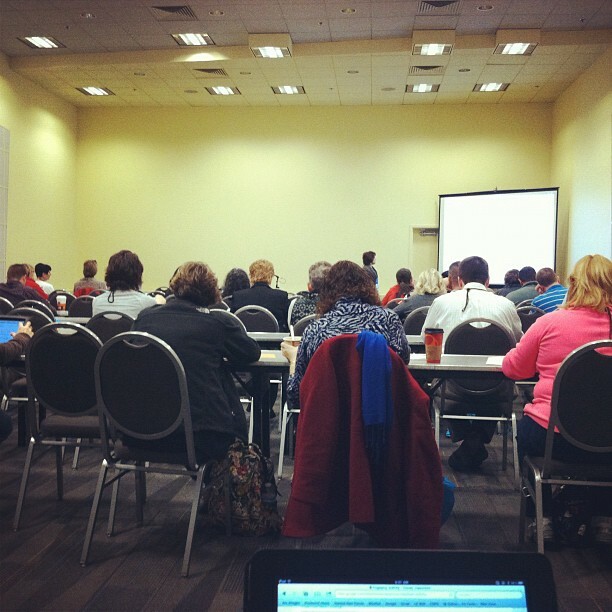 This year's conference had a lot of excellent sessions and ideas for the classroom. I am anxious to try them in the Reading Workshop classes. Students were treated to an excellent message during an assembly today. Jim Basketball Jones focused on applying kindness and care to everyone around you. He encouraged students to look for the good in classmates and to have each others' backs. In addition, he performed an array of basketball tricks that excited the school, and kept everyone engaged. 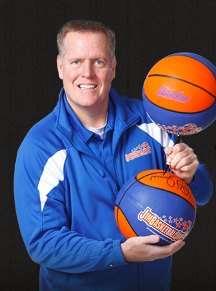 His ability to spin and juggle basketballs amazed everyone present. Jones pulled a lot of students up to the front to help with his demonstration and utilized them to help with his message of becoming successful through hard work, responsibility, and making good choices. One of the main motivations in Jones's life was wanting to be like his brother, Mike. This makes me wonder, what is your motivation? What makes you like you are? Who do you follow? What did the assembly mean to you? How do your thoughts about reading compare to your classmates? Image being the best. Imagine having such an advantage that no one could compare. Think about being so superior that three million people watched you perform on Youtube. That is how it is for Mamadou Ndiaye'. Imagine for a moment, Reading Workshop students, if you had an amazing ability. And then take it even one step farther. What if you had an amazing ability and it wasn't in sports. What would your talent be? And how would you impact the world? Describe your success.